The statue was usurped by Ramesses VI (1143-1136 BC) and later by Pinedjem a High Priest (1070- 1032). The king wears the nemes headdress with the double crown of Upper and Lower Egypt and his arms are crossed, holding crook and flail; symbols of kingship. At his feet, Princess Bent’anta holds a flower and wears an Uraeus crown of rearing cobras. Her name Bent’anta (Bintanath, Bint-Anath, Bintanat) is Syrian, meaning Daughter of Anath, referring to the Canaanite goddess Anath. Her mother was Isetnofret, one of Ramesses’s most important wives. Before the later Shoshenq court is the second pylon. It was built by Horemheb (1323-1295 B.C.) who filled the interior of the pylon with thousands of stone blocks from demolished monuments built by the Heretic king, Akhenaten. But it was unfinished and only partly decorated at his death. Ramesses I later completed the decoration and replaced all of Horemheb’s cartouches with his own and it was again usurped by his grandson Ramesses II. Today the second pylon’s outer wall is severely damaged and its original height is unknown. The first pylon was built by the Ethiopian kings (656 BC). 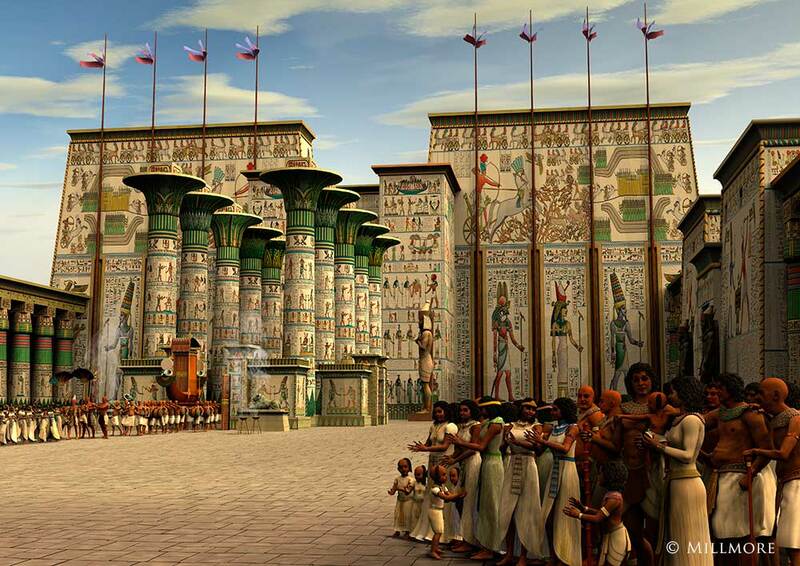 This vast Court holds the Kiosk of Tahraqa and the Second Pylon. The lake is 129 X 77 meters and was used for ritual navigation. The pylon shows Thutmose smiting his enemies. Temple of the moon god Khonsu – son of Amun and Mut.